Swiss Post’s branch network, which employs 5,500 staff, is to be transformed into a modern organization: the networking of the extensive experience of these employees at the customer front will be improved and the scope for entrepreneurial freedom at the grassroots level strengthened. Teams will be created that will work at several branches in a district, where they will be responsible for all Swiss Post access points. As a result of the new team organization, the management structure will also be adapted. Positions will be filled starting in May 2019 at the earliest. The new team organization will have no impact on the number of branches in the postal network. A growing number of customers are increasingly taking care of their postal transactions around the clock and on the go. Swiss Post is adapting its access points to postal services continuously to meet changing customer requirements. There are currently 1,078 Swiss Post branches throughout Switzerland. For historical reasons, the majority are managed by many small teams, which are often made up of a branch manager and one or two customer advisors. In future, postal network employees will be consolidated into teams working across multiple branches, giving them a holistic view of Swiss Post’s services and access points and allowing them to provide customers with more comprehensive advice. 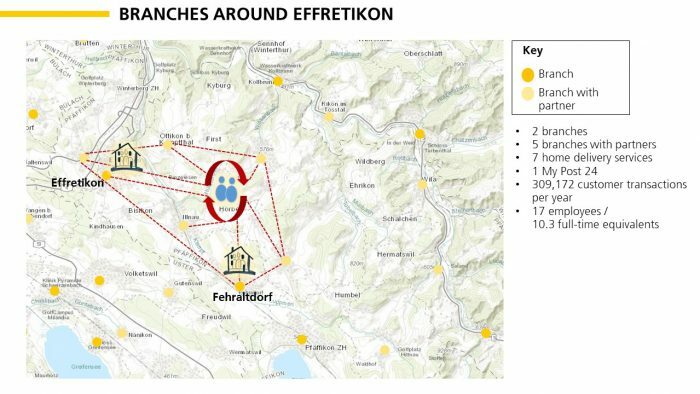 Today’s strictly hierarchical structures will be replaced in the future by teams responsible for all of Swiss Post’s various access points in a particular district. Unlike times past, customers today can choose the service that makes their everyday life easier from a wide range of Swiss Post access points. These include branches, branches with partners, acceptance and collection points, My Post 24 terminals, the home delivery service and business customer points. Swiss Post’s post office staff are experts with a great deal of experience in serving their customers, and they understand exactly which local services are appropriate for their customers’ needs – for example the best place to post a parcel after eight in the evening. “Customers increasingly expect our employees to have a general overview of the services available in their region. The focus of the reorganization is on the individual strengths of local employees. We have to change our approach and promote the skills and capabilities of each individual,” explains Thomas Baur, Head of PostalNetwork. For each district, teams of around 15 customer advisors will now be created within the branch district, working in different branches, providing advice to employees of branches with partners or support with My Post 24 terminals. “We want to understand the concerns of our customers and identify their requirements more quickly” beyond the boundaries of any particular branch, Baur says, explaining the new team structures. This will also make the day-to-day work of customer advisors more varied. But the new team organization will call for a high level of flexibility. Thomas Baur understands the uncertainty felt by the employees affected: “I know that the change will not be easy for everyone. Many people feel at home in their “own” branch. For many, the new entrepreneurial freedom and the varied nature of the work will be new. I am conscious of the fact that it will take some time to adapt to this change”. Example of new team organization in the canton of Zurich. In the future, Swiss Post anticipates having seven regions as opposed to the current 15 and around 50 rather than 100 branch districts. The 1,000 or so branches currently operating under 700 branch managers will then be managed by around 350 team leaders. There will be deputies in place for the majority of management roles, and they will also have a management role. Swiss Post will implement the changes in stages and plans to start filling the new management positions in May.